We started things off with the documentary panel consisting of Geof Bartz, Milton Ginsberg, Geoffrey Richman and Jean Tsien – who were being moderated by Lillian Benson. This panel was designed to give an insight into the different processes and changing aspects/issues of cutting Documentary. Geof Bartz showed us "Boy Interrupted" – chosen as his own "most difficult to work on" project. He explained that he tried to make the doc have a home video feel because the most impactful footage came from the home movies taken by the family featured in the film. He went on to further explain that rather than sit and make notes while combing over the footage he preferred to sit and simply talk and discuss (while the footage was playing) with the producer and director – he was able to take away emotion and story elements from their conversations that helped structure the piece. Milton Ginsberg chose "Catwalk" – a doc he did that was never really released due to improper "release-form management". He said it was his favorite because the doc focuses on the fashion industry, which was something he had very little experience with. This gave him the ability to bring a fresh set of eyes and craft something without knowing or even really hearing anything about the topic prior to cutting – he went further to discuss how for this particular doc he didn’t work with any notes, he began at a point and pushed his way into the story. Geoffrey Richman showed us "The Cove". 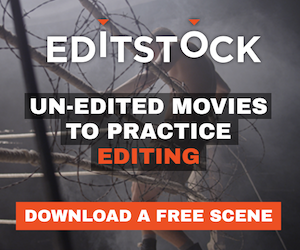 He explained that upon beginning the cut there was a long list of topics with no real direct story, yet by constructing a mission statement of what they were trying to get across it allowed them to begin the edit and gain focus. He further stated that it’s most important for a documentary editor to always keep the mindset of the audience, to separate yourself from the footage and moments - regardless of their strength - in order to make it the best you possibly can. Jean Tsien brought us "Scottsboro", "Shut Up and Sing" and "Travis". Her reasoning behind showing these three very distinctly different doc-clips is to show that the characters are at the mercy of the editor, writer and director – meaning that regardless of content, we have the ability to show any sides of them that fit the particular story. It’s our jobs as editors to make the audience feel for them. She also stresses the importance of collaboration not only with directors and writers but also with the Assistant Editors – their connection to the footage can make for great ���sounding boards’ during the edit. Next up was the ���Anatomy of a Scene’ with Alan Heim, moderated by Bobbie O’Steen. If you’ve read O’Steen’s book "Cut to the Chase" you’ll understand that she was the perfect choice to host this session – the warmth and knowledge she brought to the discussion was unbeatable. Alan Heim looked at his work on "Star 80" – now you have to hear the man actually tell his stories and explanations of what makes a cut work to truly grasp this, but from a few simple words you can completely understand why he makes such a great Editor: He’s warm, funny, honest and to the point (politely of course) in discussing every aspect of his work. He explained that to make the cut you must make the decision, cut and move on. He likes to cut around the beat, give the audience the information of the scene and continue moving forward. He also stressed that it shows your abilities as a storyteller if you trust the audience to get what you’re trying to say and not beat a point to death. Following that was ���Cutting Yourself Out of a Corner’, which was moderated by the Manhattan Edit Workshop’s Josh Apter and featured Mark Livolsi, Sabrina Plisco, David Ian Salter, Thelma Schoonmaker and Allan Title. Mark Livolsi showed us a scene from "Almost Famous" that was dropped which involved Led Zeppelin’s "Stairway to Heaven", had 3 other characters (besides the mother and son) in the scene – it in the end got cut to simply the mother and son, completely omitting the song and 3 other characters! He stressed that sometimes, whether you like it or not, you are forced to make strong surgical cuts to a scene that people like for the betterment of the story. Sabrina Plisco showed us a scene from "Beverly Hills Chihuahua" where the lead female dog is saved from Mountain Lions and then taken back to the Chihuahua village. The scene was originally suppose to have flashbacks to the history of the village and the race of dogs – as originally the tone was to be more of an homage to Mexico and less comedy, yet at the last minute the scene got cut and changed into what we now have. She stressed that in this job any sequence can change at any moment – you have to be ready to deal with these kinds of studio changes as they happen very frequently. David Ian Salter brought with him the Jelly Fish race sequence from "Finding Nemo". He explained that in working on fully animated films there are so many variables that often once a cut is made and rendered, tiny changes must be made constantly to make that one cut work. His example was the Jelly Fish themselves as opposed to the main characters in the scene. When he cut to a certain angle or view and handed it off to the visuals team, often times they would all have to sit and work together to make the tentacles of the Jelly Fish behave in a way that didn’t affect or distract the scene – each individual tentacle on each fish had it’s own set of variables (think of it as allowed space programmed into the computer for that tentacle to move) that were affected when a cut was made. Often once cut meant ten other variables had to be considered or redone after the fact to make it work - on every cut. He stressed that editing on an animated film is often considered at the very beginning of the film as opposed to the end, and that all of it can easily become a giant "balancing act". Thelma Schoonmaker brought us a scene from "Raging Bull". Jake LaMotta explains to his brother that he doesn’t want to loose weight in order to fight some young kid. His brother explains to him that it’s a win-win situation regardless of if he wins or looses. She explained that this was the hardest scene to cut out of anything she’s ever had to do because of the improvisation DeNiro and Pesci had together. Martin Scorsese usually shoots any improvisational scene using two cameras but in this instance couldn’t due to the fact that the set wasn’t big enough to allow two cameras – so hours of improv on one actor and then hours on the other. She explained that while too much material can hurt an editor the issue with this scene was that all of the acting was so good it became a mission for her and Scorsese to find the scene in all the footage. She further explained that her one piece of advice to editors is to have patience above all else. Allan Title screened a clip from Arctic Roughnecks – where two men were driving to a remote arctic town to deliver fuel and battle the elements. His story with this scene shows the need for the ability to cope in any situation of a shoot/edit. They were originally supposed to shoot nearly three months of footage on an oilrig and literally two days before the shoot their permits were revoked at which point they were told about these two drivers. Months of footage literally became a few hours as these guys did their daily job. He stressed that often in a tough situations, which happen very frequently, it’s important to learn how to remain calm and compromise to get the job done – his example: a budget has already been spent to get something done and at the last minute things change – do you loose the money or turn a negative into a positive? He stresses that you must heighten the footage to make the character and the story reveal itself. Admittedly this last panel is the hardest to sum up because of the sheer volume of information given - we had The Editors of Avatar: John Refoua and Stephen Rivkin, who were moderated by Vincent LoBrutto, discuss the multiple-year groundbreaking process to finish this film. From my own opinion I akin the stories and experiences explained during this panel to a battle of World proportions. Imagine cutting a film at a reference cut, performance cut and at a visual cut - Three different workflows all going on at once and all at various levels of completion. The film got a reference cut - meaning the acting was shot on the motion capture stage which was then determined if that shot was to be used in the next stage the performance cut. This cut involved adding the captured acting performance and applying it into the virtual "Avatar" world where shots were manipulated and created. They could choose a close up shot and a particular line reading during the reference cut, completely change camera position and camera movement within this virtual world to fit the upcoming edit. After this came the visual cut where the elements were delivered to WETA in New Zealand (who created the polished look of the film we now see) before it was handed back to the editors to refine once again. Imagine including at all three levels - stunt people, crowd scenes and hitting deadlines. I can’t stress enough that this summary of the editing of Avatar doesn’t do their telling of the tale full justice – they had to learn about the technology involved in shooting and create the workflows from scratch and find a way to make it all work – in my mind their example epitomizes the reason more light should be shed on the role of the Editor – also that really they should be considered in the same light as pioneers of cinema - their example is now and will forever be built upon and refined for many years to come. Special Thanks to the Art of the Guillotine’s Gordon Burkell for inviting me to share my thoughts with you... and that wraps up my coverage of Edit Fest NY 2010! I would encourage anyone with a budding interest in editing as well as those already working (time permitting of course) to come out and support this great series of editing events - It really is like attending a one-day film school where everything is worth learning and applying to our daily routines. I hope you’ve enjoyed it and I would love to hear some feedback from anyone interested in letting me know what they thought – jjn@digitallygone.com - and I shall be bringing you postings from Edit Fest LA 2010 coming this August – it’s going to be my first time in LA so if you see me around please stop by and say Hello! DAY 2 - Edit Fest LA 2010! Tonight we were treated to the opening panel for the 2010 Los Angeles EditFest. Hosted by Randy Roberts with a panel consisting of Mark Chesse, Ed Abroms, Sally Menke and Pam Wise. John Nicholls Bloggin' live from Edit Fest NY 2010!